…and save nearly £2m in agency fees in the process! South London and Maudsley NHS Foundation Trust (SLaM) provides the widest range of NHS mental health services in the UK and employs over 4,600 staff, many of whom are Mental Health Nurses. However it operates in a sector facing some significant recruitment challenges. According to a recent report from the King’s Fund*, since 2010 the overall total number of NHS mental health nurses in England has dropped by 15% with hospitals facing the biggest fall in nursing staff from 24,581 to 19,170 – a loss of 5,411 posts (22%). In addition, the national problem of an aging workforce that is not being replaced quickly enough (in 2013, more than 32% of mental health nurses were aged over 50), and the abolition of bursaries for student nurses was also likely to increase the recruitment problems in the future. The impact was already being felt in the Trust with increasing work pressure caused by the lack of Band 5 nurses on the wards being cited by current staff as the primary reason for leaving. In this highly competitive environment, SLaM decided that they needed a more strategic and cohesive advertising strategy and above all, they needed to ‘shout’ louder to make themselves heard when they did go to market. This led to the appointment of a dedicated Band 5 resource – an Employee Resourcing & Employer Branding Manager (ERBM) with a brief to reignite attraction channels to bring the NHS Trust back into the forefront of candidates’ minds as an Employer of Choice. Late in 2016 the Trust committed to a long-term profile building strategy to make their recruitment campaigns more effective. They had recognised that there was a need for highly visible creative advertising that could reach out to both active and passive candidates. WDAD Communications were asked to work with the Trust to produce the campaign creative concepts and artwork, with a brief to evolve the messaging over the year and adapt the creative in response to the quality and volume of candidates seen at assessment days. Based on anecdotal feedback gathered at a number of Open Days, and analysis of the annual staff survey results, it was evident that two of the Trust’s biggest selling points – the breadth of services the Trust deployed, and the training and career pathways it offered – was either not being communicated or was not understood in the external marketplace. This information helped to inform the creative brand messaging with the objective of raising the level of awareness/knowledge of the Trust with potential employees – and also where to advertise. The latter involved turning traditional thinking on its head by focusing on ‘old school’ print advertising with a series of employer brand building advertisements in the London Metro and Evening Standard. Online advertising with the Guardian and the professional nursing media would be used for additional ‘hot spot’ topping up campaigns when needed. The initial campaign launched in December 2016 with a series of ‘fun’ advertisements – two pre-Christmas and one post-Christmas: ‘Get something you actually want this year’. The campaign started to explain the core USPs of a career with SLaM and established the employer brand messaging. SLaM then built on this with the broader ‘The Mind is Fascinating’ concept to focus on the breadth of services and subsequent career opportunities at the Trust. The campaign included a series of graphical visual puzzles across consecutive pages of the publications. 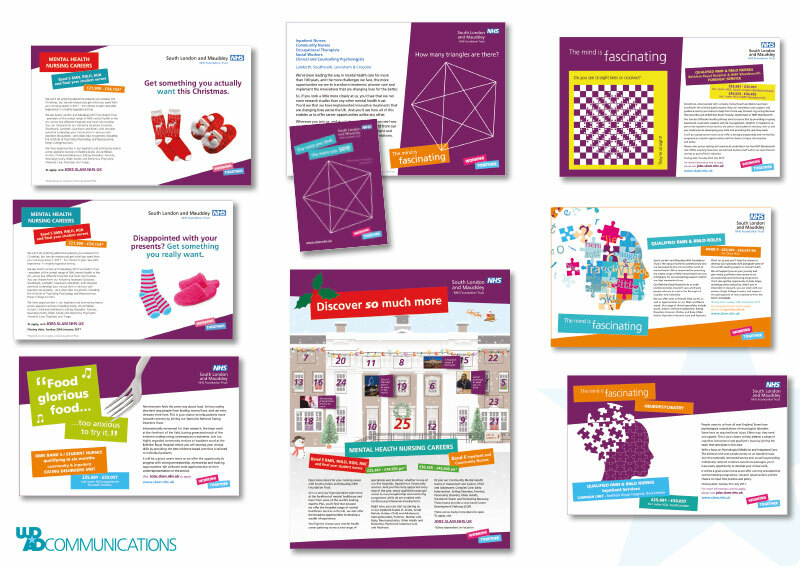 Finally the year’s advertising culminated in December 2017 with a full page advertisement in the Metro / Standard that brought together all strands of the campaign into a career opportunity ‘Advent Calendar’ design – ‘Discover So Much More’ – with a series of career messages behind each advent window. In January 2017, Band 5 vacancies level across the Trust had stood at 224.7. By July 2017, the Trust had 33 starters and 55 with confirmed future start dates and a further 147 Band 5 candidates in the pipeline to join. The overall vacancy rate had dropped to 135.3 (-39%), and to use another measure, by July, the Trust had achieved the same level of offers that had been made throughout the whole of the previous year. As of January 2018, the Trust had 74.4 Band 5 vacancies. This represented a 66% reduction over the 12 months. The latest campaign generated a further 73 applications which the Trust is confident will lead to the rate declining still further. With a total of 158 Band 5 ‘direct’ starters over the period, it meant that there has been a significant reduction in staffing agency use. This has been estimated to have saved the Trust c.£14k per appointee equating to a saving of over £1.9million. A welcomed effect of the recruitment of the Band 5s has seen a reduction in team members leaving due to the lack of staff on the ward – rate was at 23% in December 2016 and as of November 2017 it had fallen to 14%. As a result, this has contributed to a consistent service being provided to the patients through having a consistent team in post; thereby addressing a key national problem identified in a 2015 report by the Care Quality Commission** which revealed that only 14% of mental health patients said they received appropriate care in a crisis.